This Pali Ke Kua is a one bedroom plus loft unit, it boasts a master bedroom with king-size bed, private bath, and soaring cathedral ceilings, as well as a bright airy upstairs loft with two twin beds (which can convert to a king) with an additional full bath. No Smoking allowed. All of the modern conveniences you expect in an ambiance that is purely Hawaiian. 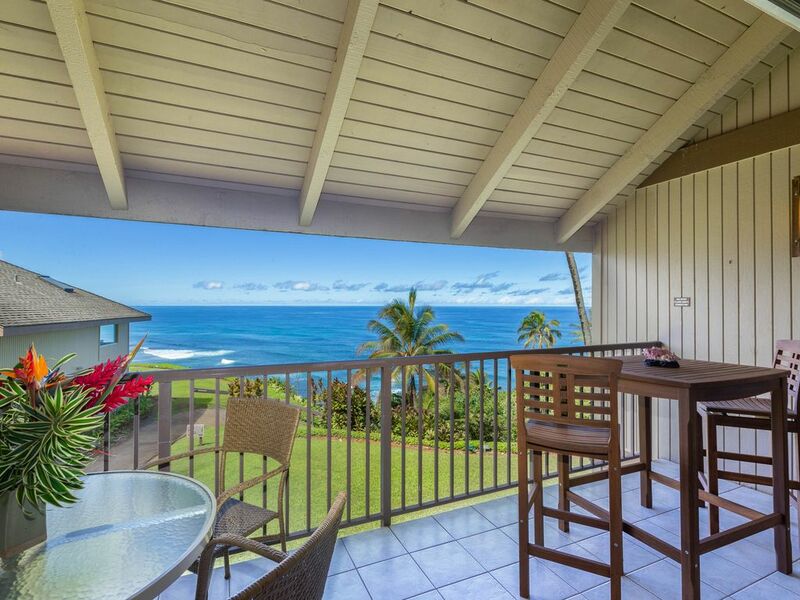 The spacious lanai captures the beauty of Kauai's North shore in all of its splendor. Pali Ke Kua has a private, paved path down to Hideaways Beach. This section of Hideaways Beach is difficult to access except by this path and is therefore fairly secluded. It’s is known for incredible swimming, surfing and is considered to be one of the best snorkeling spots in Hawaii, please be advised there is no Life Guard on Duty. Fine restaurants, golf, hiking. surfing, swimming. boating, snorkeling, and many other recreational activities are just minutes away. We’ve stayed at Pali Ke Kua three times now and #207 is by far the best I all ways. The view is unsurpassed. We’re sure this is the most beautiful place on earth! May all who stay in this lovely place have as great a time as we have had these past two weeks. -Visitors from Newport Beach, Calif. The condo was wonderful…we lacked for nothing. You have provided a wonderful opportunity for people to enjoy a natural wonderland in the most luxurious, relaxed, family environment . This is a great find! This condo is great! The view far surpasses our expectations. We will now be spoiled when we travel. Pali Ke Kua is a great place to be! Paved path to Hideaways beach. Fabulous ocean views! 1 Bedroom plus Loft 2 bathrooms. Corner unit with beautiful ocean views and Bali Hai views from living room and lanai!